A page-turning literary debut about a mother and her two teenage daughters escaping a cult and starting over. Two sisters sit in the backseat of a car, bound at the wrists by a strip of white cloth. Their mother, Amaranth, drives for days without pause, desperate to get away from the husband she fears will follow them to the earth's end. Her daughters, Amity and Sorrow, cannot comprehend why they're fleeing or fathom what exists outside their father's polygamous compound. When an exhausted Amaranth crashes their car in rural Oklahoma, rescue arrives in the form of Bradley, a farmer not unfamiliar with loss and uncertain futures. At first mistrustful of the strange, prayerful trio, Bradley allows his abiding tolerance to get the best of him, and the four become a new kind of family. 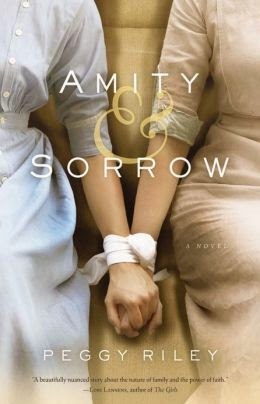 Full of achingly beautiful prose, AMITY & SORROW is a mesmerizing debut about belief, redemption, and the dark heart of extreme faith. 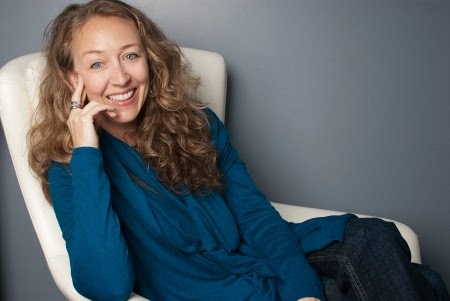 Peggy Riley is a writer and playwright. She recently won a Highly Commended prize in the 2011 Bridport Prize. Her short fiction has been broadcast on BBC Radio and has been published in "New Short Stories 4", Mslexia Magazine, and as an app on Ether Books. Her plays have been commissioned and produced off-West End, regionally and on tour. She has been a festival producer, a bookseller, and writer-in-residence at a young offender's prison. Originally from Los Angeles, Peggy now lives on the North Kent coast in Britain. She is currently working on her second novel, which will be set in the women's internment camp on the Isle of Man during WWII. This is one of those books in my stack it's taken me a while to get around to. I've been waiting for the mood to hit me and a space of time to be able to read it. I'm so glad the time was now. It just seemed to fit with some things I've been hearing on tv and thinking about in the world around me these days. Peggy Riley is a strong writer with the quiet voice of a sledge hammer wrapped in quilting! Her prose is powerful and fraught with so much symbolism and meaning, it would take a book group to ferret it all out and to enjoy every morsel. It was a great deal of fun for me as a single reader, as well. But I stopped several times thinking I'd love to discuss the novel and certain situations with a friend or two. It's often been a wonder to me that so many women have found themselves caught in the web of polygamy and abuse. But Ms Riley works to define the minds of her characters, and the insidiousness of a lie from a man whom a woman or child wants to put all her trust and hopes in for salvation. When the "safe place" becomes an inferno, however, all bets are off. And herein lies the story of "Amity & Sorrow." Riley does a fantastic job of creating the place and time of this novel. She also creates strong and believable characters who stand up under the difficult circumstances in which she places them. I felt the psychology of her characters rang true to this story, making it all the more an absorbing one to read. Sorrow in particular grabbed my heart and engendered strong reactions from me...mostly negative! I loved this book and highly recommend it. It's nicely out in paperback these days which won't put a hole in the budget. Any book group would find it a very compelling read to discuss.